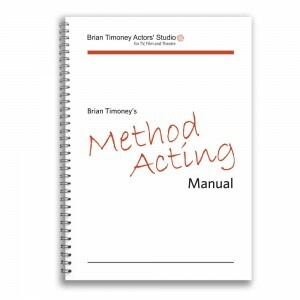 I have collected together some of my finest Method Acting materials together and created a Method Acting Manual that will provide you with clear instructions, exercises and techniques guaranteed to impact your acting ability at a deep level. Here is what is included in the manual. A success indicator track to allow you to measure and detail your practice activities and the impact on your ability on a week to week basis. Exercises on how to produce emotion on cue. The progression of sense/emotional memory exercises to build sensitivity and concentration. The 7 areas of investigation to apply to your scene work. Connection exercises to allow you to build a strong connection with your scene partners. 45 in-depth questions to answer to help build your characters history. How to build intricate and in-depth characters. My own personal concepts and observations on acting. The 3 As that get mistaken for talent but take no talent to do. Voice and movement skills you need to know. Knowing how your habits affect your acting. Understanding why taking direction is crucial. I find this class essential for a clear understanding of how to access this technique called “Method acting”. It has also allowed me to initiate a much deeper connection with myself as well as with the characters I play. With any good drama class you need a teacher that is honest and focused to get the best acting out of you. This is the first time in a long time I have really acted in this sort of environment. The classes are small so you get a lot of individual attention as well as valuable group work. I would recommend this to anyone with a passion for acting and wanting to find a little bit more about themselves, but be prepared to step over some boundaries!